My cousin who was also my dear friend passed away August 8, that was a couple days ago. People knew how close we were and how much time I have spent with him the past 3 weeks while he was in hospice. Knowing that he was going to die, and having talks with him about life and death, fear and happiness will always be a part of my journey with home. The other part of my journey, is trying to get a message to what, what NOT to say when people are grieving. Honestly I love the fact that so many people have given me their condolences. It has been wonderful, but in my grief, there are a few things I have noticed that does not help and in fact hinders. Today, in my blog I would like to address that so we can be real with people and not just use a template for offering condolences. I have heard it at least a dozen times if not more, “He is out of pain now” or “he is in a better place now.” That does me no good! How do people really know he is out of pain now? Did they know if he was or wasn’t in pain? Are people pretending to know that someone is out of pain supposed to help my grief? Another one is hearing about other people’s experience. I can barely breathe and I have to listen to someone reliving their experience. That does not help. The same goes for I know how you feel. I want to ask people really? Do you? Grief is individual no one knows how we feel. He’s with God now is another one that gets to me. That does not make me feel better. I know I sound angry and maybe ungrateful rest assured I am not. I am thankful for the people that care for me. What I am baffled by lack of originality. “He is out of pain now” is nothing more than a template of words. 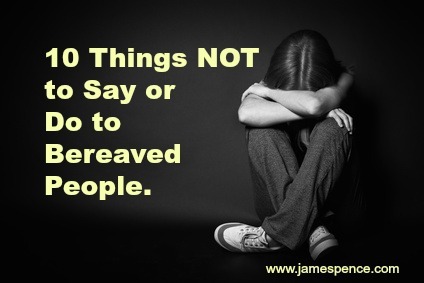 So what do you say to a person that is grieving? The best thing I have heard since I have entered my grief is simply sorry for your loss. Sorry goes a long way. It comes from the heart. It means someone really is sorry. They are not offering me advice, or telling me what I already know, they are just saying they are sorry for my loss. It is four words that in a grievers world means a great deal. Of course bonuses like do you need anything is nice. I may need a shoulder to cry on, or a meal, or someone to sit with me. I may need understanding that I do not want to talk or share or giggle or laugh. Asking me what I need is important. Telling me he is out of pain is useless and feels as though it negates everything. Many grievers feel the same way. My cousin was in pain, he is dead of course he is out of pain good grief! So the best thing I can say to people, and I specialize in grief, is say you are sorry, offer condolences and let it be. Sometimes the less you say, the more it means. Next time you are dealing with someone who is grieving, please think about using your heart and not a template of words. Most of us are at a loss for words when we see someone suffering from grief. It is okay. Let he person be in pain. It is all part of the grief journey. 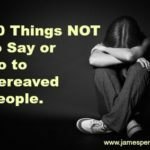 As important as it is to know what to say to someone, it is important to know what NOT to say when people are grieving.